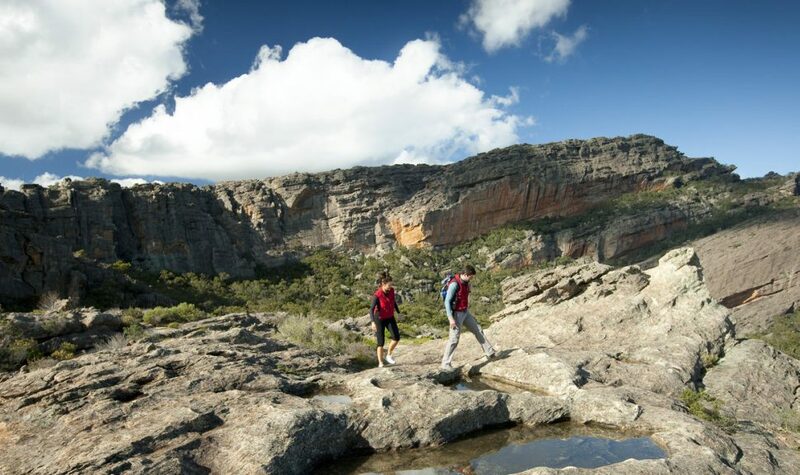 Mount Stapylton walk is suitable for fit and energetic walkers, can involve water crossings, slippery track surfaces, rock hopping and rock scrambling. Signs and track markers guide the way up the steep rock slope of Flat Rock to a splendid vantage point overlooking a natural amphitheatre. The track descends briefly to the base of the impressive Taipan Wall before continuing its steady climb along terraces to a track intersection. Follow signs and track markers on the final steep ascent, which involves some rock hopping and scrambling past a wind scoured cave. The view from the summit is spectacular, taking in much of the park and surrounding plains. Return by the same route.